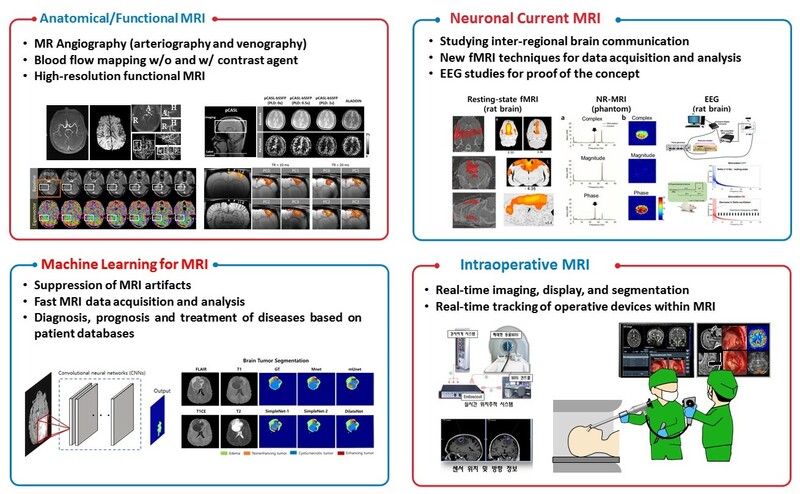 Broad research interests of magnetic resonance imaging (MRI) laboratory at Korea Advanced Institute of Science and Technology (KAIST) lie in (i) developing new MRI techniques of image acquisition, processing, and analysis, (ii) unveiling the inter-regional brain communication mechanism, (iii) applying machine learning algorithms to MRI databases and MRI artifact suppression, and (iv) developing intraoperative MRI devices, These technical developments can make big differences in understanding baseline and functional brain physiology, and also diagnosis / prognosis / treatment of our body. Our brain requires coherent information flow for inter-regional communication. However, it is still not clear how a neuronal group selects its communication target. We are trying to develop a new fMRI technique that enables us to detect neuronal currents directly rather than the conventional fMRI relying on secondary hemodynamic responses. We try to use the new fMRI technique as well as systems biological approaches for better understanding of the inter-regional brain communication mechanism and use EEG to prove the concept. Machine learning has been of interest to the many research areas and one of the hottest applications is biomedical imaging. 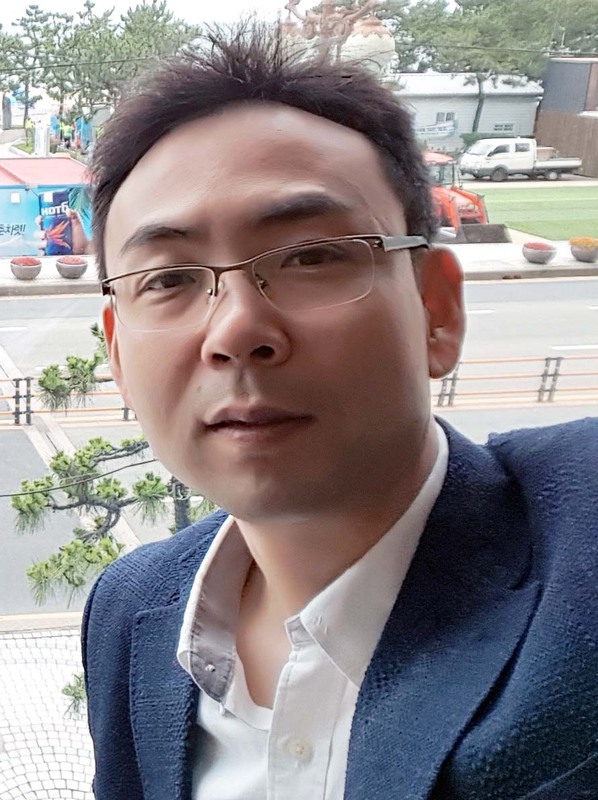 We are trying to develop and apply machine learning algorithms for MRI artifacts suppression, denoising, fast MRI data acquisition and analysis, and diagnosis/prognosis/treatment monitoring of various diseases. We have tried to integrate all these imaging techniques for multi-parametric assessment of various brain diseases. We believe combination of the various aspects of the brain would provide much more accurate information than conventional approaches. Also we expect this approach can stimulate interdisciplinary collaborative studies involving engineers, neuroscientists, and clinicians. 2. Sung-Hong Park and Timothy Q. Duong. Brain MR Perfusion-Weighted Imaging with Alternate Ascending/ Descending Directional Navigation. Magnetic Resonance in Medicine, 2011, Jun;65(6):1578-1591. 3. Sung-Hong Park and Timothy Q. Duong. Alternate Ascending/Descending Directional Navigation Approach for Imaging Magnetization Transfer Asymmetry. Magnetic Resonance in Medicine, 2011, Jun;65(6):1702-1710. 4. Sung-Hong Park, Chan-Hong Moon, and Kyongtae Ty Bae. Compatible Dual-Echo Arteriovenography (CODEA) using an echo-specific K-space reordering scheme. Magnetic Resonance in Medicine, 2009, Apr;61(4):767-774. 5. Sung-Hong Park, Kazuto Masamoto, Kristy Hendrich, Iwao Kanno, and Seong-Gi Kim. Imaging brain vasculature with BOLD microscopy: MR detection limits determined by in vivo two-photon microscopy. Magnetic Resonance in Medicine, 2008, Apr;59(4):855-865. 7. Dongwook Lee, Kyong Hwan Jin, Eung-Yeop Kim, Sung-Hong Park, and Jong Chul Ye, Acceleration of MR Parameter Mapping Using Annihilating Filter-Based Low Rank Hankel Matrix (ALOHA). Magnetic Resonance in Medicine, 2016;76(6):1848-1864.